On this day, the band was licky. Everybody picked up three or four hours more sleep before beginning the cycle again. Lunch, a sound check at the hall, the concert, a late snack, back on the bus, on to the next city. It's a process that Petty and the four Heartbreakers will repeat for the next three months on a tour that includes three shows, starting tonight, at the Inglewood Forum. The band will go through a disorienting series of emotional ups and downs, matching the exhilaration of the concerts against the numbing routineness of a straitjacket schedule off-stage. 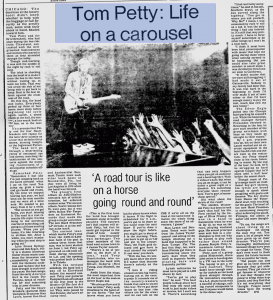 Remarked Petty: "Someimes I feel like I'm stepping back on the same carousel when I go on the road. You jump up, grab a horse and go round and round. By the time we stopped touring last year, we had been out for nine months and we were all a little nuts. We needed to get away from it for a while. "But as soon as you get home, you start missing it. The road is a real romantic life style. It's like being in the merchant marine or something and going to all those exciting places. When you get home, it's like returning to civilian life. After a while, you start wondering when the next ship is going out." Like Bruce Springsteen and Bob Seger, Petty is a classic American rocker whose music combines the innocence and accessability of the '50s with the thematic ambition and realism that has been brought to rock over the years. His best songs, from the early American Girl to the recent The Waiting, speak of reaching for and remaining true to your dreams. Petty and the Heartbreakers (guitarist Mike Campbell, drummer Stan Lynch, bassist Ron Blair and keyboardist Benmont Tench) knew each other back home in Gainesville, Fla., but they were all living in Los Angeles in 1976 when the band was formed. The group's first album on ABC/'Shelter attracted lots of crititcal attention, but achieved modest sales. The second album, You're Gonna Get It, went gold, but it was 1979's Damn the Torpedoes on Backstreet Records that made the group a major attraction. The new Hard Promises LP already is at the million sales mark. 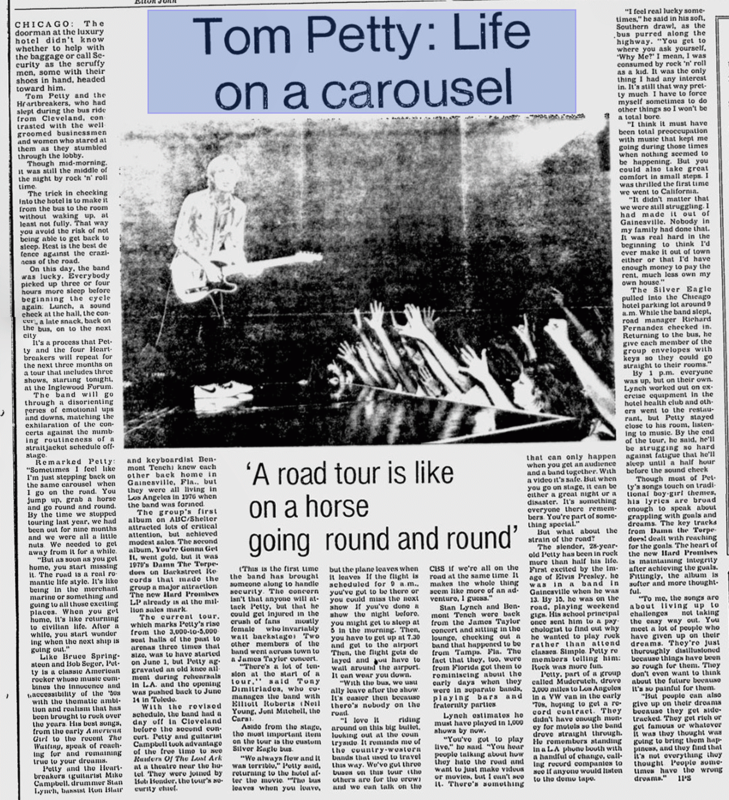 The current tour, which marks Petty's rise from the 3000-to-5000-seat halls of the past to arenas three times that size, was to have started on June 1, but Petty aggravated an old knee ailment during rehearsals in L.A. and the opening was pushed back to June 14 in Toledo. With the revised schedule, the band had a day off in Cleveland before the second concert. Petty and guitarist Campbell took advantage of the free time to see Raiders Of The Lost Ark at a theatre near the hotel. They were joined by Bob Bender, the tour's security chief. (This is the first time the band has brought someone along to handle security. The concern isn't that anyone will attack Petty, but that he could get injured in the crush of fans -- mostly female -- who invariably wait backstage). Two other members of the band went across town to a James Taylor concert. "There's a lot of tension at the start of a tour," said Tony Dimitriades, who co-manages the band with Elliott Roberts (Neil Young, Joni Mitchell, the Cars). Aside from the stage, the most important item on the tour is the custom Silver Eagle bus. "We always flew and it was terrible," Petty said, returning to the hotel after the movie. "The bus leaves when you leave, but the plane leaves when it leaves. If the flight is scheduled for 9 a.m., you've got to be there or you could miss the next show. If you've done a show the night before, you might get to sleep at 5 in the morning. Then, you have to get up at 7:30 and get to the airport. Then, the flight gets delayed and you have to wait around the airport. It can wear you down. "With the bus, we usually leave after the show. It's easier then because there's nobody on the road. "I love it -- riding around on his big bullet, looking out at the countryside. It reminds me of the country-western bands that used to travel this way. We've got three buses on this tour (the others are for the crew) and we can talk on the CBS if we're all on the road at the same time. It makes the whole thing seem like more of an adventure, I guess." Stan Lynch and Benmont Tench were back from the James Taylor concert and sitting in the lounge, checking out a band that happened to be from Tampa, Fla. The fact that they, too, were from Florida got them to reminiscing about the early days when they were in seperate bands, playing bars and fraternity parties. Lynch estimates he must have played in 1,000 shows by now. "You've got to play live," he said. "You hear people talking about how they hate the road and want to just make videos or movies, but I can't see it. There's something that can only happen when you get an audience and a band together. With a video it's safe. But when you go on stage, it can be either a great night or a disaster. It's something everyone there remembers. You're part of something special." But what about the strain of the road? The slender, 28-year-old Petty has been in rock more than half his life. First excited by the image of Elvis Presley, he was in a band in Gainesville when he was 13. By 15, he was on the road, playing weekend gigs. His school principal once sent him to a psychologist to find out why he wanted to play rock rather than attend classes. Simple, Petty remembers telling him: Rock was more fun. Petty, part of a group called Mudcrutch, drove 3,000 miles to Los Angeles in a VW van in the early '70s, hoping to get a record contract. They didn't have enough money for motels so the band drove straight through. He remembers standing in a L.A. phone booth with a handful of change, calling record companies to see if anyone would listen to the demo tape. "I feel real lucky sometimes," he said in his soft, Southern drawl as the bus purred along the highway. "You get to where you ask yourself, 'Why Me?' I mean, I was consumed by rock 'n' roll as a kid. It was the only thing I had any interest in. It's still that way pretty much. I have to force myself sometimes to do other things so I won't be a total bore. "I think it must have been total preoccupation with music that kept me going during those times when nothing seemed to be happening. But you could also take great comfort in small steps. I was thrilled the first time we went to California. "It didn't matter that we were still struggling. I had made it out of Gainesville. Nobody in my family had done that. It was real hard in the beginning to think I'd ever make it out of town either or that I'd have enough money to pay the rent, much less own my own house." The Silver Eagle pulled into the Chicago hotel parking lot around 9 a.m. While the band slept, road manager Richard Fernandez checked in. Returning to the bus, he gave each member of the group envelopes with their keys so they could go straight to their rooms. By 1 p.m., everyone was up, but on their own. Lynch worked out on exercise equipment in the hotel health club and others went to the restaurant, but Petty stayed close to his room, listening to music. By the end of the tour, he said, he'll be struggling so hard against fatigue that he'll sleep until a half hour before the sound check. Though most of Petty's songs touch on traditional boy-girl themes, his lyrics are broad enough to speak about grappling with goals and dreams. The key tracks from Damn the Torpedoes! dealt with reaching for the goals. The heart of the new Hard Promises is maintaining integrity after achieving the goals. Fittingly, the album is softer and more thoughtful. "To me, the songs are about living up to challenges -- not taking the easy way out. You meet a lot of people who have given up on their dreams. They're just thoroughly disillusioned because things have been so rough for them. They don't even want to think about the future because it's so painful for them. "But people can also give up on their dreams because they get sidetracked. They get rich or get famous or whatever it was they thought was going to bring them happiness, and they find it's not everything they thought. People sometimes have the wrong dreams."